How to Improve My 10k Running Time? I want to improve my 10k running time. Recently I did a training run in my "tempo run" zone and ended up doing 10k in 1h04'. I read your 10k program, but in your opinion, is it still necessary to go through those weeks, taking in consideration that I can already run the distance? How can I improve my pace thus reducing the time to run 10k? Right now, I'm a "beginning runner", and let me introduce to you as I already know something about yourself :). By the way, your website is amazing. The quality of the information is awesome. I'm from Portugal, and live near Oporto, in the north part of this country. I use the "beach sidewalk" (I think that this is the right way to describe the street and the sidewalk that follow the coastline) as my "gym", and have always the Atlantic Ocean as an "eye witness" :). I began to run, because I wanted to lose some weight, and began to have some motivation, buying the Nike Plus kit to use on my iPod. The landscape is also very beautiful, although in the winter, rain and wind is waiting for me. I'm contacting you, because of some doubts I have. Right now, I have 20 runs and a total of 90km in a average pace of 6'44"/km. I didn't fully needed 7 weeks to run 30 minutes. Last week, I arrived at your website, and I read about how to use the heart rate monitor, as a guide to do your workout. I'm 34 years old, and I got a Polar HRM from a friend, just to try it. I run 30 minutes as usual, and I discovered that I was running between 171 and 180 bpm. Next run, I tried to run 30 minutes at my tempo run maximum of 162bpm. I ran 20 minutes and felt very good? Then 30 minutes, 40 minutes, 50 minutes and finaly ran 10km, in 1h04'. My pace was 6'40"/km for the 7km, and in the final 3km, I ran at 5'40"/km (my normal pace to 5km). My average pace was 6'26"/km, about 60 seconds above the pace I usualy have for 5km. I was amazed how I did it. I was feeling really good, I was smiling when I was achiving the 10km mark. So, my question now is, given this situation, how can I improve my running. Thanks for the helpful advice you have on your website. I am happy you find my site useful. You can already run 10k. 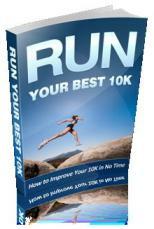 My 10k training program is designed for absolute beginners who try to get to their first 10k. In other words, this program is not really suitable for you. If you are after a suitable 10k running program, you'll need to look into something a bit more advanced. There are different options. You could for example, choose to get Daniel's Running Formula. It will tell you everything you need on how to build your own training program. I have used it extensively throughout my running careers. See my book review of Daniel's Running Formula for more information. In addition to that I would advise you to check out the running training section of my site which has many useful articles that can help you further. A good article on my site which brings together quite a bit of information is Improve Your Running, check it out.